This class uses a variety of activities, songs and props to encourage children to experiment with different skills such as running, kicking and jumping. In this class we have added several more advanced skills while still using fun activities, songs and props to engage children. In this class parental involvement is gradually decreased. More advanced skills are introduced on this level such as; controlling the ball, kicking into a target and passing. This is all done through the use of props and games. This class uses many of the skills that were introduced in the 3 year old class. In addition, we now add the concept of turn taking and working with a partner while practicing specific exercises. In this class the children are ready to be challenged with more complex skills. Some of these skills are dribbling, passing and shooting and foot-eye coordination. This is all done using a variety of props and exciting games. This is an extension of the previous class. More advanced skills are introduced. Children are beginning to understand the concept of teamwork. 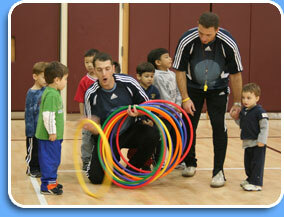 In this class the children are learning the basics of participating in small-sided games. This is done in a non-competitive environment with everyone learning at their own pace.